This historic riverside inn and restaurant is situated on the banks of the River Nene in the pretty village of Nassington near Peterborough. Enjoy a delicious meal or snack in the restaurant or in the bar with its welcoming open fires in the winter. AA 4 Star Inn, Two AA Rosettes for Food. 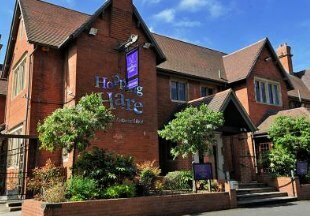 Originally a manor house, the Hopping Hare dates back to 1902 and is situated 2 to 3 miles from the centre of Northampton. The hotel boasts luxury rooms with kingsized beds and a stylish, contemporary restaurant. A perfect base for visiting Althorp House and Silverstone. The Crewe Arms is a real country pub in Hinton-in-the-Hedges in rural Northamptonshire. Enjoy a selection of cask ales, soft drinks and wines served with or without traditional home cooked food. Stay in either of our two en-suite rooms with modern facilities which include shower, flat screen TV, coffee and tea making facilities. Free Wi-Fi is also available in the pub on request. Welcome to the historic Talbot Hotel, reputedly haunted by the ghost of Mary Queen of Scots. The oak staircase and other parts of the building, were brought from the ruins of Fotheringhay Castle. The hotel boasts oak beams, open fires and transomed windows. The intimate restaurant and cosy bar offer traditional British cuisine, fine wines and real ales. The Talbot has recently been fully refurbished, keeping its charm and character while bringing the facilities bang up to date. The Saracens Head, more than four hundred years old, is featured in Charles Dickens' first novel, 'The Pickwick Papers'. The same homely comforts enjoyed by Charles Dickens when visiting Towcester have been restored and blended with today's luxury. We now serve food all day throughout the lounge and bar areas. The Lounge Bar welcomes locals and visitors to relax over a glass as they have done for hundreds of years. The split level bar offers three distinct areas of relaxation where delicious snacks are available. . The Heart of England is a converted 18th Century Farmhouse which now operates as a pub, restaurant and 13 bedroom hotel. The hotel is located just a couple of miles from the M1 and 6 miles from Northampton. It also offers easy access to Milton Keynes and Coventry. Weedon is located between Northampton and Daventry and just a few miles from the motorway. The pub forms an integral part of the hotel experience, and the menu offers a selection of pub classics and a broad range of constantly changing specials to tempt you, with the fantastic all day offer of 2 main meals for the price of 1. Welcome to our handpicked selection of hotels and inns in Northamptonshire. An ideal location for a weekend away, Northamptonshire is home to many stately homes open to the public including Althorp and its exhibition dedicated to Princess Diana, as well as destinations such as Billing Aquadrome, the beautiful Nene Valley and Rockingham Forest. Often overlooked as a short break destination, the Northamptonshire countryside includes forests, rolling hills and ancient hunting grounds. For walkers, there are seven long distance footpaths and for cyclists, there are 15 different routes and tours. And where better to stay than a friendly country inn! 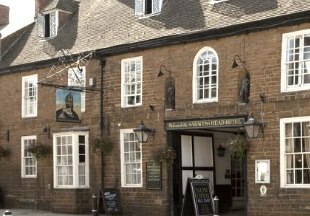 We have included village inns and inns in market towns in our selection below, so whether you want to immerse yourself in the countryside or fancy a livelier location, you will find your ideal hotel or inn in Nottinghamshire here! "There's something extra special about an ancient inn. Oak beams, uneven floors, open fires - and maybe a ghost or two! - all add to the character and a sense of being somewhere rather special. 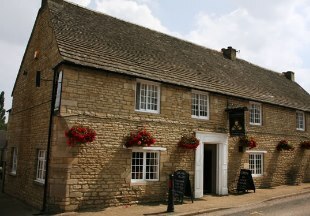 The Queen's Head at Nassington has been welcoming travellers for 200 years. Charles Dickens stayed at the 400 year old Saracen's Head in Towcester. 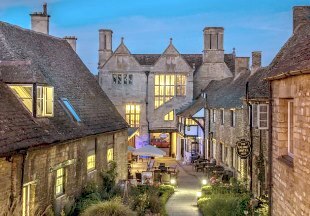 And of course the Talbot Hotel at Oundle is reputedly haunted by Mary, Queen of Scots... "
Northamptonshire is bordered by Warwickshire, Leicestershire, Rutland, Cambridgeshire, Bedfordshire, Buckinghamshire, Oxfordshire and Lincolnshire. 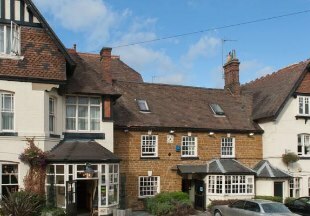 If you want to widen your search, why not browse through our selection of hotels and inns in Warwickshire, Leicestershire, Rutland, Cambridgeshire, Bedfordshire, Buckinghamshire, Oxfordshire and hotels in Lincolnshire.